Moving time: 3 hr 57 min. Wind: 5 mph west (head) during middle 20 miles. Otherwise light, variable breezes. Weather: 68°F in the morning; got up to 85°F. Mostly cloudy in the morning; rain for about 30 minutes in the second hour, partly cloudy afternoon. Not as hot and humid as last few days! I got an early start under cloudy skies this morning. 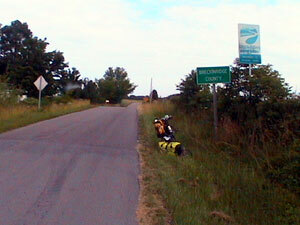 A few miles into the ride I crossed a highway at an exit. These highway exits always have cheap truckstop breakfasts so I decided to partake in one.Some liquid sunshine started about 9:00am and tapered off a half hour later. I rode in the rain and it sure felt good! It keeps me cool and sure beats the sun! I met two other riders today on a Cannondale tandem bike with a BOB trailer. 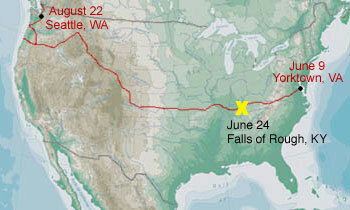 They were eastbound and originated their ride in San Francisco in April. We stopped and talked for a while about the weather and terrain. They assured me that the Ozarks are not too bad and I told them how rough Eastern Kentucky and Virginia are. The girl riding stoker has terrible allergies, causing her eyes to swell and her nose to run. She was in miserable condition but was making it happen. I advised them to take their time and not let the mountains beat them up too much. They've had a good trip with no major incidents and are looking forward to dipping their front tire in the Atlantic in a few weeks. So far I've met a rider or group every three days or so - some I've passed going westbound. I've overtaken at least three westbound riders but have yet to be overtaken as far as I can tell. People simply travel at different rates. I just feel good that my pace is not lethargic. There is hardly any roadside trash around here. People keep things pretty clean and well kept as compared to the eastern end of the state where it is a veritable hog hole. It is easy to see how far away the next town is around here - all you have to do is look for the water tower. I'm not used to seeing water towers too often at home in Pennsylvania or in my trip so far. In hilly and mountainous country all they have to do is put a reservoir or tank of water up on a hill. In the flatlands of western Kentucky there are few hills and those that do exist simply are not high enough to supply adequate pressure. These big, blue tanks of water in the sky are usually in the middle of town or just on the edge. I'll start looking for them to help me judge distance a little better. The people I met on the tandem today also told me about how in Kansas there are grain elevators and silos that you can see from 10 miles away. I hit another milestone in my ride today; the central time zone. 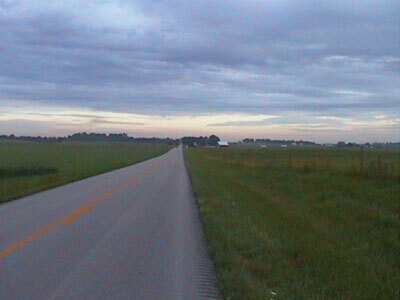 The Breckinridge/Hardin County line in Kentucky makes up part of the boundary between the eastern and central time zones. Here is a picture of my bike at the line. Rough River dam was built in 1955 by the US Army Corps of Engineers as a flood control, irrigation, recreation and water supply project. It holds back the Rough River for quite a few miles and reminds me of other dams I've seen before. 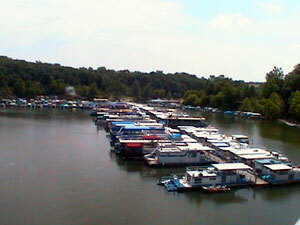 There are not many rivers and very few natural lakes in Kentucky due to the extremely porous limestone bedrock. Water quickly drains into the ground in this entire region and hardly gets a chance to run or collect on the ground. Mammoth Cave (which I passed near today) is just one of the many underground drainage systems that constitutes thousands of miles of passageways. 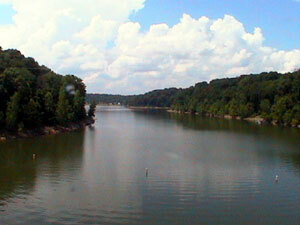 Here are some pictures of the Rough River Reservoir. People continue to be overly friendly around here and are not afraid to chat about themselves or hear about my trip. I usually end up talking to someone at just about every stop I make. Everyone has a story; part of this trip is to hear those stories as part of a mosaic of the American experience. A nice family at the campsite beside me offered a soda and sloppy joe sandwich which was much appreciated. The mother told me matter-of-factly "I hear that some people actually ride their bikes across the country to Oregon from here." She was amazed to find out that I am one of them and we talked for a while about the journey. They owned a very substantial pickup truck so I figured that they might have some tools with them. I need a large wrench to tighten my headset but they didn't have any tools. Tomorrow I'll push on to Sebree, KY - a 70 mile ride.